The Huskies' two standout freshmen, Marquese Chriss and Dejounte Murray, announced Wednesday they will both leave Montlake after one season and take a shot at the pros. 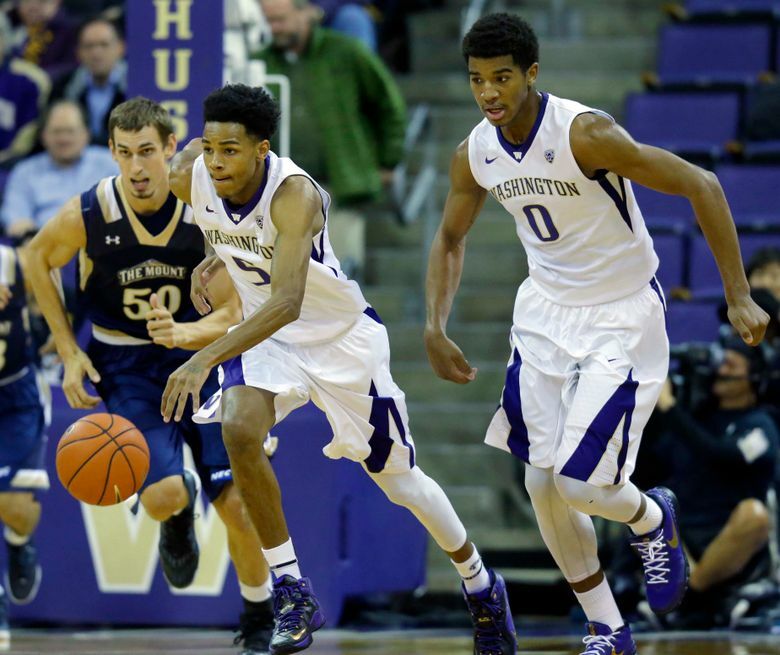 Less than two days after finishing their season, Washington freshmen Dejounte Murray and Marquese Chriss effectively ended their college basketball careers. Both released tweets Wednesday afternoon announcing they’ll enter the NBA draft this summer. The Huskies said Murray and Chriss plan to sign with agents and will not return for the 2016-17 season. “Those guys worked hard all year and had phenomenal seasons,” coach Lorenzo Romar said. “Coming in I don’t think anyone thought they would have good enough seasons and do as much to where they could after a year be first-round draft choices. It seems like that’s the case. Romar said early feedback from the NBA suggests the Husky freshmen will be taken in the first round of the June 23 draft. He shared the information with the NBA hopefuls and didn’t make a heavy-handed proposal for them to stay in school. “I may not be the best person to make the pitch for them to return because it may seem like I’m doing it for my own purposes,” Romar said. “Just talking to the NBA people and how they were talking about those guys, you just knew in this day and age it’s hard for kids to turn that down. Murray is projected as a No. 10 pick by NBAdraft.net and Chriss is predicted to be the No. 11 pick by ESPN. Murray, a 6-4 1/2 guard, was voted second team all-Pac-12 and selected to conference’s all-freshman team. He had one of the finest freshmen seasons in UW history. Here’s where he ranks: assists (first), points (second), steals (second), rebounds (third) and minutes (first). He also set the UW freshman scoring record with 34 points on Feb. 3 against Arizona State. Murray averaged 16.1 points, 6.0 rebounds and 4.3 assists. Only three freshman have matched or exceeded those numbers in the NCAA since 1996-97 – LSU’s Ben Simmons (19.2, 11.8 and 4.8) this season and Iowa State’s Curt Stinson (16.2, 6.0 and 4.3) in 2003-04. Meanwhile, Chriss, a 6-8 forward, has been equally dazzling. Here’s where he ranks on UW’s all-time freshman list: blocks (first), points (third), rebounds (fourth) and minutes (ninth). Chriss averaged 13.7 points, 5.7 rebounds and 1.6 blocks. He also set the Pac-12 record for 138 fouls and was disqualified 15 times. Murray and Chriss join a long list of UW players under Romar who have left early and were chosen in the draft including: Nate Robinson, Martell Webster, Spencer Hawes, Isaiah Thomas, Terrence Ross and Tony Wroten Jr.
UW players from the past, present and future chimed in via twitter. Losing Murray and Chriss is a big blow for Washington, which finished the season with Monday’s 93-78 loss at San Diego State in the second round of the NIT. The Huskies were 19-15 overall and tied for sixth in the Pac-12 at 9-9, which exceeded expectations for a team picked 11th in the preseason media poll. Still, UW missed the NCAA tournament for a fifth straight year, which has Huskies fans restless. Without Murray, Chriss and senior guard Andrew Andrews (20.9 points per game), Washington loses its top three scorers who accounted for 60.4 percent of the scoring. The leading returning scorers are freshmen reserves Noah Dickerson (7.5 points) and David Crisp (7.2). Returning starters Malik Dime, a junior center, and freshman guard Matisse Thybulle average 6.9 and 6.2 points, respectively. Freshman reserve Dominic Green, who averaged 2.7 points, could slide into Murray’s old spot while newcomers Sam Timmins and Matthew Atewe, who both sat out this season, will provide help on the front line. Washington is also expected to lean heavily on incoming freshman Markelle Fultz, a five-star point guard from Maryland. Romar is open to filling the two immediate vacancies on the roster, but said it’s not a priority. He also didn’t rule out more players leaving. “Last year when it didn’t seem like things were looking too bright, we knew internally that things were going to be better than what people thought because we knew what we had coming in,” Romar said. “I’ll say the same thing about next year.